Meichelle Arntz has seen the instability that foster care programs can force on children. About three years ago, Arntz, a registered nurse, began training to be a Court Appointed Special Advocate (CASA) for Santa Barbara County. CASA volunteers help guide abused and neglected children through court proceedings. She recalled being assigned two brothers, one nearly 2 years old and one 4 years old. Seeing how such a program could be harmful to a child/s development, Arntz set out to think of better ways to serve young children in need. The result was Angels Foster Care of Santa Barbara County, which serves children throughout the county. “I was so upset looking into the program that I wanted to start a different type of foster care,” she said. One of the most crucial needs foster children have is learning how to bond with others within the first two years of life, Arntz said. She said 80 percent of prison inmates have been in foster care systems. She said that a number of children who experience detachment disorders by age 2 find it difficult to overcome them later in life, which can lead to rebellious behavior. So Arntz found a model for the foster care program she would help develop for the Central Coast - Angels Foster Care of San Diego, which had successfully placed about 200 babies in foster care since its original formation nearly a decade ago. Arntz began training for her own license and in 2006 founded her program and began serving as executive director of the board. 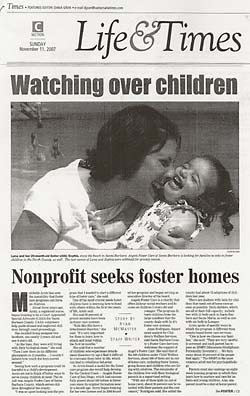 Angels Foster Care is a charity that offers 24-hour social workers and focuses on children 2 years old and younger. The program diverts children from the large numbers that the county deals with in it’s foster care systems. Anne Rodriguez, department analyst for Children’s Welfare Services, said Santa Barbara County’s Foster Care Services welcomes the support of Angel’s Foster Care. She said that of the 900 children under Child Welfare Services, about 568 of them are in out-of-home care, including foster homes, group homes and children who are living with relatives. The remainder of the children live with their biological parents in a supervised setting. “With any of those kids (in out-of-home care), about 56 percent can be reunited with their parents and the rest cannot,” Rodriguez said. She added the county had about 75 adoptions of children last year. There are shelters with beds for children that need out-of-home care as soon as possible. Such shelters, which are all at their full capacity, include two with 12 beds each in Santa Barbara and Santa Maria, as well as one with six beds in Lompoc. Arntz spoke of specific ways in which the program is different than county-based foster care services. “One is how we choose our families,” she said. “They are very carefully screened and each parent has to pass an MMPI (Minnesota Multiphasic Personality Inventory). … We turn away about 30 percent of the people that apply.” The MMPI is the most common adult test for psychopathology. Parents must also undergo an eight-week training program in which they learn how to nurture and care for infants and young children. Also, one parent must be a stay-at-home parent. Arntz also said Angels Foster Care families have to keep children for at least 12 months at a time and they are only allowed to care for one child, though they may have biological children of their own. This allows for much more individual attention for a child, as traditional foster families sometimes have as many as six children, not including their own biological children, she said. The restriction makes it easier to recruit families, she said. Children stay with qualifying foster parents until they are adopted or reunited with their biological parents. The families receive a monthly state reimbursement of $425. Arntz said Angels Foster Care needs more support countywide, especially in Lompoc. Currently, the program has 14 children in 14 foster homes, but has had to turn away 36 infants since January. Some children had to be sent to families outside of Santa Barbara County, which makes it more difficult to eventually reunite with their birth parents. One Lompoc mother-of-four, who asked that her name not be used, said she took a child from Angel’s so that her children could experience being around an infant. Her children have even helped in caring for the infant in their own ways - her 8-year-old changes dirty diapers and her 11-year-old supervises the infant in the bath.